Rosa Rubicondior: Murmuring Starlings Do It Naturally. One of the most spectacular sites in nature in Britain is a winter 'murmuration' of starlings, and I'm fortunate enough to live just a short drive from the open stretch of moorland north of Oxford known as the Otmoor, now a wonderful RSPB-owned nature reserve and important inland wetland site, where this spectacle can be seen most winter evenings at sunset in suitable weather. Watch these videos first, then I'll discuss them. The first was filmed over Otmoor, the second at Gretna in Scotland. The most noticeable thing is how the flock seems to move and flow like a single organism, almost as though the birds are obeying a single consciousness with decisions to change direction being almost instantly transmitted to each individual. This has led people to speculate about some sort of telepathy between the members of the flock. One can almost hear Deepak Chopra declaring to his credulous followers that 'Quantum Cosmic Consciousness' or some such meaningless gibberish explains how everything from flocks of starlings to shoals of fish and even herds of wildebeest and reindeer are all coordinated. That is, of course, a delusion and simply illustrates how people look for simplistic answers without being too concerned about whether it's the right one. It seems more important to some people to settle for any answer than to have the uncertainty of not knowing and having to admit that to others, or even to themselves. It's the same psychological process which allows people to settle for a 'God did it!' answer to any scientific mystery, and even to things which are actually not scientific mysteries but the science is hard to understand or doesn't give the required confirmation of pre-existing bias. But what we are witnessing in these spectacular displays is actually something quite basic and fundamental in science. We are seeing how a few simple, natural rules can give rise to apparent order from chaos. It had been assumed that each starling in the flock tries to maintain a discrete space around itself and reacts almost instantly to the position of the five starlings closest to it, so a change in one part of the flock is quickly transmitted across the flock. Now a new study by a team from Rome, which is noted for its murmurations of starlings, has shown that this is only part of the story. Decisions to change direction appear to be made by a small group of birds flying close to one another as though merely being close triggers a change of direction. This is not always the same birds as there is no formal leader, but can be initiated by any small group that finds itself flying closely together. It's as though the entire dynamics of the group are finely balanced and can flip with a small change, like any system in true chaos or a system subject to quantum fluctuation. In effect we are seeing the result of a law of mass action. Collective decision-making in biological systems requires all individuals in the group to go through a behavioural change of state. During this transition fast and robust transfer of information is essential to prevent cohesion loss. The mechanism by which natural groups achieve such robustness, however, is not clear. 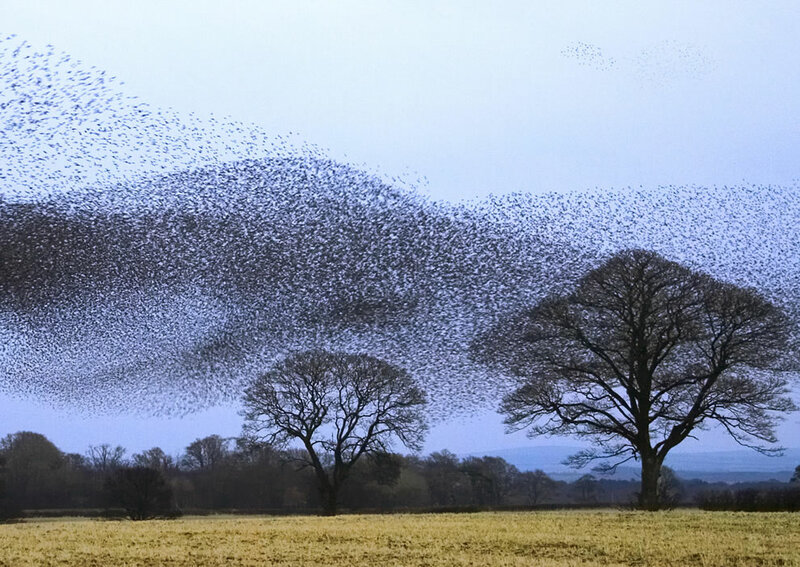 Here we present an experimental study of starling flocks performing collective turns. We find that information about direction changes propagates across the flock with a linear dispersion law and negligible attenuation, hence minimizing group decoherence. These results contrast starkly with present models of collective motion, which predict diffusive transport of information. Building on spontaneous symmetry breaking and conservation-law arguments, we formulate a theory that correctly reproduces linear and undamped propagation. Essential to this framework is the inclusion of the birds’ behavioural inertia. The theory not only explains the data, but also predicts that information transfer must be faster the stronger the group’s orientational order, a prediction accurately verified by the data. Our results suggest that swift decision-making may be the adaptive drive for the strong behavioural polarization observed in many living groups. It's not magic, just basic physics and gives a clue to how information flows through any such dynamic system. The speed of information transfer depends on the degree of orientational order, or, in layman's terms, how parallel they are flying to one another. Those flying parallel to the turning group will turn fastest; this flying at an angle to them will react less strongly, and so on. A wave of change thus propagates through the flock spreading out from the original center. Meanwhile, other small groups will be initiating another change all of their own and the closer the flock becomes concentrated the more ordered will be their orientation so the more quickly they will change. A diffuse part of the group will change less quickly. As Dylan Winter says in his commentary to the Otmoor video, this flock behaviour has probably evolved for two reasons - to warm up the birds before settling down to roost and as a flight display by which the fittest males establish their supremacy in the flock and so their entitlement to the best perches. And a single bird in a mass of wheeling and changing identical birds is much less likely to be the subject of an attack from a predator such as a peregrine falcon, which will find it difficult to home in on any particular individual. If you look carefully at the Gretna video you can see a peregrine falcon make repeated unsuccessful dives into the flock. The same bird could probably take a single, isolated starling in flight with consummate ease. There is never any need to invoke magic or exotic hypotheses to explain natural phenomena. If the answer is currently not yet known this does not mean it is unknowable. A gap in our understanding does not indicate a gap in the natural order of things; it simply means we haven't worked it out yet. Order can emerge from chaos by the operation of a few simple rules. There is no consciousness or intent required. Order emerges perfectly naturally and inevitably, and quite contrary to one of the favourite lies of creation pseudo-scientists that order cannot come from chaos. The order itself has no real significance. Simply because we recognise a 'design' or a pattern - which we are especially prone to doing - does not mean there was any intent to produce that 'design'. Whatever emerges from chaos will look like a design. In the case of murmurating starlings, we see organic shapes moving and responding like living, flowing organisms do, or at least how we can imagine they do if they were large enough, and so it's easy to assume there must be a consciousness controlling it and an intent to make those shapes in the sky. The answer is much more interesting than magic, even if it is more difficult to understand. Simple explanations are for simple people who aren't bothered about the truth, and for frauds to sell to simple people so they don't need to think for themselves. Just like religion in fact. And I've probably given Deepak Chopra an idea for his next million-dollar book. Marvelous videos! BTW: I can't see the illustration to the left beneath the abstract. It's just a white square. At Lund University in Sweden researchers have compared how zebra fish and bumblebees avoid collisions; see: http://www.lunduniversity.lu.se/o.o.i.s?id=24890&news_item=6150 . Some quotes from that article: 1) All animals need some form of warning system that prevents them colliding with objects in their surroundings. The warning system helps them to continually regulate their speed and judge their distance from objects. For flying and swimming creatures this is an extra challenge because they also have to deal with winds and currents that affect their speed and direction. 2) The results showed that zebra fish also use optic flow. However, the zebra fish did not react in the way the researchers had expected. “Surprisingly, the fish steered towards a stronger optic flow rather than away from it like the bees”, said Christine Scholtyssek. 3) In other words, the fish chose to approach objects rather than steering away from them. The researchers believe the reason for this could be that zebra fish live in a more turbid underwater environment where visibility is only around 30 centimetres. This means that the zebra fish are reluctant to swim away from objects because they risk finding themselves in a situation where they have no points of reference in their surroundings. This in turn makes it more difficult to use their in-built warning system to control speed and direction. Some quotes: 1) [A] small group of fly neurons is solving calculus problems, or what for humans are calculus problems. 2) The nervous system of the fly, said Dr. Cohen, receives information about how fast the angles of its flight are changing — up, down, sideways, or rolling around an axis — and for how long that change has occurred. 3) That information must be processed to determine how much the angles have changed. And then the fly must move its wings to restore the original flight position. 5) Neurons near the wings, part of what is called the haltere circuit, do the computations and send signals to the wings to correct the problem. No, Rosa, I'm not spamming you. But now I found also this intriguing article in my digital archive: Here's Why Birds Fly In A 'V' Formation; see: http://www.huffingtonpost.com/2014/01/16/why-birds-fly-in-v-formation_n_4609100.html . Some quotes: 1) There are two reasons birds might fly in a V formation: It may make flight easier, or they’re simply following the leader. Squadrons of planes can save fuel by flying in a V formation, and many scientists suspect that migrating birds do the same. 2) Just as aerodynamic estimates would predict, the birds positioned themselves to fly just behind and to the side of the bird in front, timing their wing beats to catch the uplifting eddies. When a bird flew directly behind another, the timing of the flapping reversed so that it could minimize the effects of the downdraft coming off the back of the bird’s body. 3) Scientists do not know how the birds find that aerodynamic sweet spot, but they suspect that the animals align themselves either by sight or by sensing air currents through their feathers. Alternatively, they may move around until they find the location with the least resistance. 4) In future studies, the researchers will switch to more common birds, such as pigeons or geese. They plan to investigate how the animals decide who sets the course and the pace, and whether a mistake made by the leader can ripple through the rest of the flock to cause traffic jams.